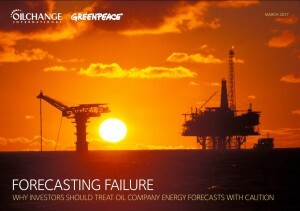 Companies like ExxonMobil, Shell and BP routinely use their in-house energy forecasts to justify investments in multi-decade, high-cost projects, from the Arctic to the tar sands. While the companies present their published forecasts as objective analyses, the forecasts rather reflect the future they want us to believe in. examines the consequences of these forecasts for investments and for climate change. It finds that the companies are highly vulnerable to disruption by clean energy technologies, and that their forecasts are playing an unhelpful role in the climate debate. The report includes a comparative analysis of the oil majors’ current approaches to thinking about energy futures, and recommendations for more robust ways to think about the future of energy, echoing the recent Task Force on Climate-Related Financial Disclosures. The Big Flop by Coal Industry and your Obsolete Politcs of Investment in the Fossil Energy.